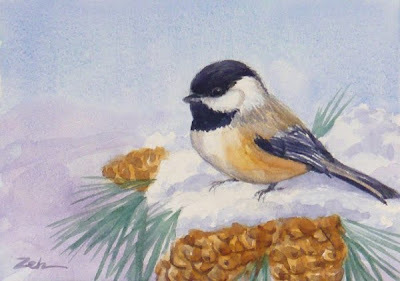 A little chickadee sits on snow-covered pine cones outside my studio window. With all the snow, the birds are at the feeders from morning until night. They have already eaten all the berries in sight, so they count on the seeds to get them through the cold winter. I love watching them dart to and fro and they make delightful painting subjects. This painting is sold. See more of my art for sale at zehoriginalart.com. Thanks for stopping by today.